The movies starred famous bodybuilders of the time who played heroes with names such as Machiste, Ursus and occasionally there would even be a Hercules movie. These movies were filmed on the extremely cheap but for a lad who soaked up fantasy the way other kids his age soaked up basketball and football they were magic. I loved those Italian sword-and-sandal movies and when Turner Classic Movies aired HERCULES, SAMSON & ULYSSES I watched it and was delighted to find that I remembered this movie from those long ago days when I was a kid sitting cross-legged in front of the family TV set held spellbound by the story unfolding in front of me. Being older I of course could see the flaws and the cheapness of the movie but y’know what? It didn’t matter. Watching HERCULES, SAMSON & ULYSSES put me back in touch with that younger Derrick Ferguson for 90 minutes and that’s a gift I treasure and cherish. For 90 minutes I wasn’t the Derrick Ferguson with adult responsibilities and worries. I was the Derrick Ferguson with nothing more important than a summer Saturday afternoon that seemed to last for a week in which I could do anything I wanted. Hercules (Kirk Morris) is asked to destroy a sea monster terrorizing local fishermen. He agrees and is accompanied by a loyal crew, a fine ship and his young friend Ulysses (Enzo Cerusico) who is the son of the local king. Hercules has been training the boy who is a long way from the heroic deeds he will achieve later on in life. But even at a young age he displays courage, agility and frighteningly keen eyesight. Hercules, Ulysses and the crew find the sea monster and kill it but they’re caught in a horrible storm that leaves them shipwrecked and washed up on the shores of Judea. During their search to find a way home, Hercules is mistaken for Samson (Richard Lloyd) when he kills a lion with his bare hands. The Judeans can’t really be blamed for mistaking Hercules for Samson as they quite naturally reason that there couldn’t be two men in the world who could kill a lion in such a way. And so Hercules and his friends are captured and sentenced to death by the Philistine King. But The Philistine King’s concubine Delilah (Liana Orfi) persuades the king to let Hercules go so that he can capture Samson. Her argument is that the only man who can capture Samson is a man as strong as he is. Hercules accepts and leaves Ulysses and his friends as hostages to go capture Samson with Delilah in tow as she obviously has a thing for nearly naked muscle men. That brings us to what we’ve really wanted to see: the fight between Hercules and Samson, which takes place among ancient ruins made of Styrofoam. And it’s a pretty good fight what with Hercules and Samson throwing huge pillars at each other before the fight ends in a draw with the two muscle men deciding to join forces to destroy the Philistine King as well as rescue Ulysses and the others. This is far from being an Academy Award winning movie. The dubbing is horrible and the movie is obviously filmed on a budget of about eleven thousand bucks. But it’s got some scenes that made me laugh such as when after the shipwreck Hercules, Ulysses and their friends are on a raft arguing. Hercules solves the argument by throwing everybody off the raft except for him and Ulysses. It’s a nice little touch that in an analogy to his superhuman eyesight Ulysses can see how emotional/relational situations will play out long before his companions. 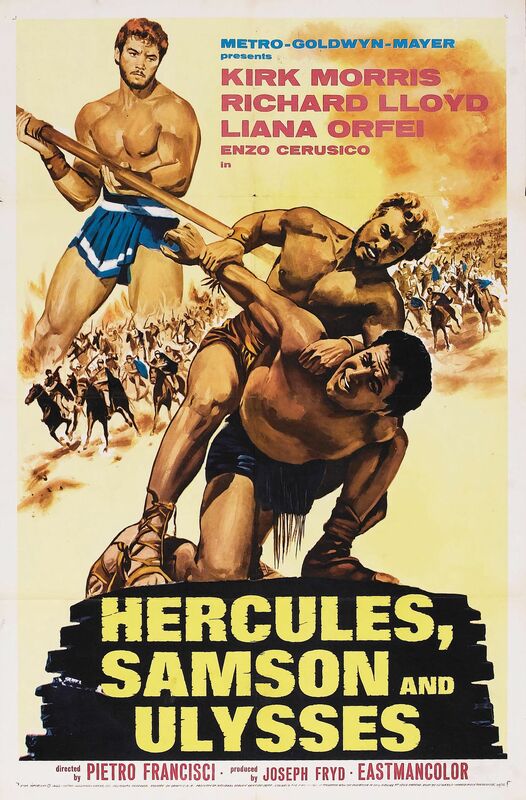 The movie also takes the time to have a sensible reason for Hercules and Samson to meet and team up. And when they do they have a nice moment where they talk about the responsibilities and burdens of being demi-gods. And it sure doesn’t hurt that Liana Orfi wears dresses that show off her more than generous cleavage. Now I don’t know if this is available on Netflix but if it is, give it a look. Or if your cable/satellite provider carries Turner Classic Movies and this happens to come on while you’re in a willing moment, turn it on and check it out. If you’re like me and remember those summer Saturday afternoons when your local TV stations showed Ray Harryhausen movies and Italian sword-and-sandal flicks, you’re the perfect audience for this one. Enjoy. I love reviews like this, Derrick, that discuss movies in an emotional, as well as technical tone. If a movie is “bad” but conjures up good memories, than it’s really not a bad movie, is it? Enjoyed the heck out of this review. That’s why I’ve never really liked the expression “guilty pleasure.” If it’s something you like and enjoy, why feel guilty about it? And when it comes to movies, sometimes it’s not about how masterfully directed or how wonderfully acted it is. Sometimes it’s about how it puts you in touch with a time and place in your life or how it makes you simply feel good. Glad I was able to communicate that in my review. It’s like I say at my site sometimes – you can get straight reviews of these movies from 1,000 different site around the internet, but you can only get me at my place. I love hearing how movies effect people. Absolutely. It’s the reason I love reading your reviews so much: it’s told in your voice. There would be no other reason to read your reviews if I didn’t get a feel of how you personally felt about what you had watched. You do that masterfully.